The John Joseph Moakley United States Courthouse is a federal courthouse for the United States Court of Appeals for the First Circuit and the United States District Court for the District of Massachusetts, located on Fan Pier on the Boston, Massachusetts waterfront. Named after Congressman Joe Moakley, the 675,000-square-foot (62,700 m2) building was completed in 1999 at a cost of $170 million and has won many design awards. The courthouse is served by a stop on Boston's Silver Line. The courthouse serves as headquarters for the United States Court of Appeals for the First Circuit and the United States District Court for the District of Massachusetts. The building houses two courtrooms for the Court of Appeals and 25 courtrooms for the District Court, as well as 40 judges' chambers, a Circuit law library, the office of a United States Congressman,[not in citation given] offices for the United States Attorney, extensive support facilities for the United States Marshals service and Pre-Trial and Probation services, as well as a day-care facility. The 675,000-square-foot (62,700 m2) building, clad in water-struck brick with granite trim, has ten floors above grade and one below. It was the first major project to be awarded as part of the United States Court Design Guidelines and incorporates General Services Administration's goals for imparting dignity and social significance, while creating modern and innovative justice architecture. Public access to the courtrooms is provided through a sequence of spaces — Entrance Hall, Rotunda, Great Hall, and Galleries. Twenty-one large-scale paintings were commissioned from Ellsworth Kelly and are installed in these areas. The courtrooms themselves are distinguished by a motif of large arches defined by wood moldings and stenciled ornament. The sub-basement houses an ice storage air conditioning system which uses half-price electricity at night to freeze water, which is then used to cool the courthouse during hot days. This saves an estimated $1.5 million per year, and helps load-balance the regional electricity grid. ^ "John Joseph Moakley United States Courthouse and Harborpark". Pei Cobb Freed & Partners. Retrieved 20 Jan 2017. 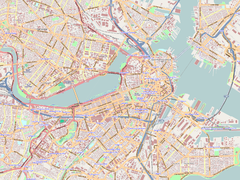 Wikimedia Commons has media related to Moakley Courthouse (Boston).